Istana “Wooden York” is the substitute name choosen for original "Woodneuk" situated not far from Tyersall Palace. 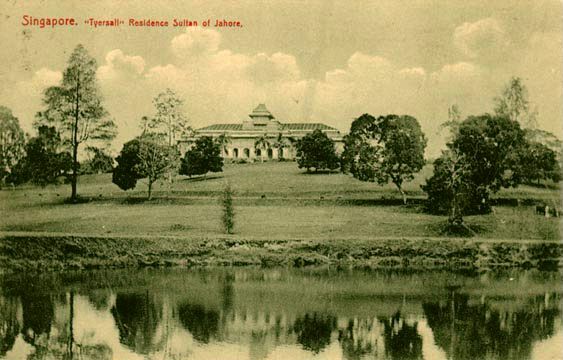 Istana Woodnuek was built in the late 1870's by HH Abu Bakar for his wife Sultana Fatimah, a Turkish princess given by Ottoman Empire. Istana Wooden York was BUILT IN 1935 to 'replace' Tyersall Palace which has been destroyed by fire in 1905. It took them 30's to rebuilt?? 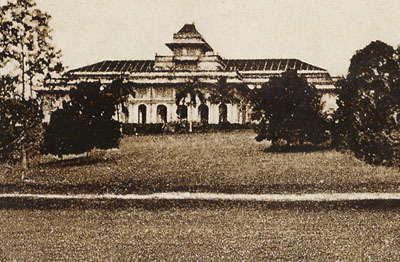 The Original Istana Woodneuk (one that belong to Sultana Fatima) was reportedly damage by fire in 1925 before replaced by a new structure known as "Istana Wooden York" in 1935. However, most people was used to call it "Woodneuk" owed to its existence for more 100 years. It is the reason why its new name (Wooden York) was not popularized except few in Johor State Government at that time. 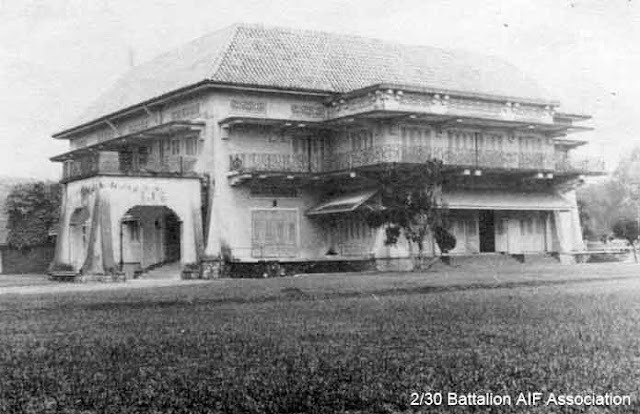 Istana Wooden York (2nd) was also reported damage by fire during heavy bombing by Japanese invader. 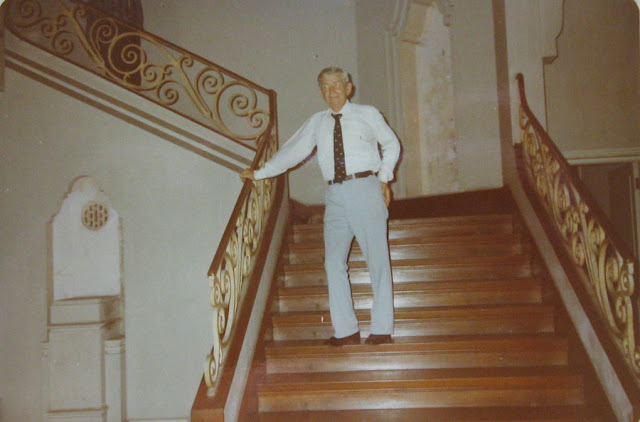 It was renovated for Malcolm McDonald in 1945 after he was evicted from Istana Bukit Serene by HH Ibrahim. 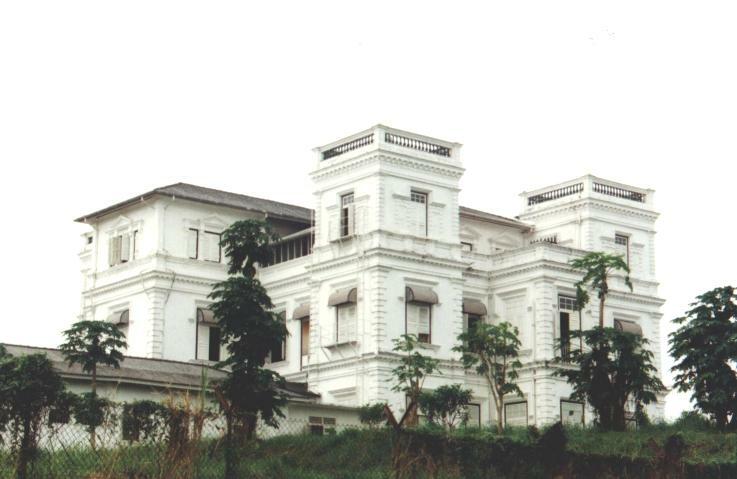 After the Malayan independent, Istana Wooden York was seldom used by HH Ibrahim, which then prefer to stay at Istana Pasir Pelangi. Due to unknown reason, HH Ismail and HH Mahmud Iskandar also reluctant to stay at Wooden York. 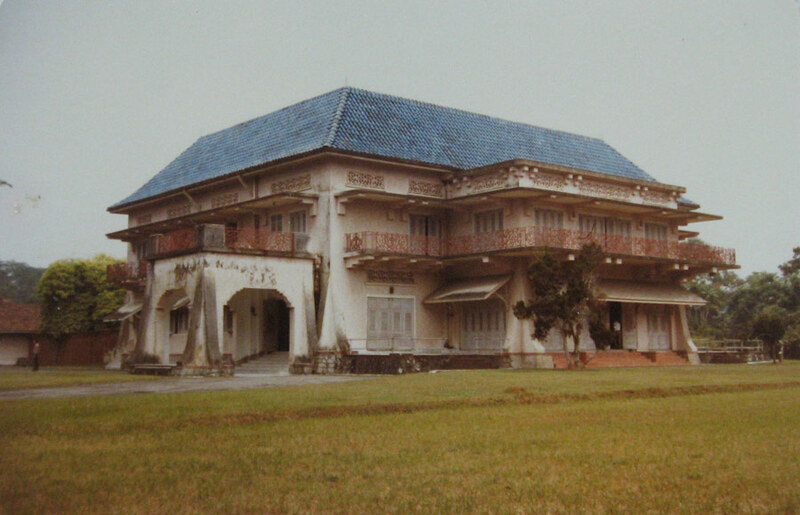 From 1957 to 1986, the compound was upkept by assistant emplyed by Istana of Johore. If I am not mistaken, his name was Hj. Sulaiman, which he live with his family not far from Istana Wooden York. .
After his demised in 2004, Istana Wooden York was left unkept, This Istana was reportedly burnt for a 3rd time by drug addicts Current condition was beyond repair. 1st emerged in the late 2007, written footnote in "Dead Men Diary" written elsewhere in this blog found amongst collection of antiquities left by the demised owner, which happen to be my Grand Dad. It has bring brilliant sparks to my chronic boredom and I started to search for this magnificient Palace onces existed in the east. It's is said that... this Palace would succumb every king's pride and turn it to envy. I took a dip into Google's world to find out about Tyersall, but nil, that time, there were very limited sources available, even inside the information's superhighways. Singapore's National Archive offer nothing except mislabelled information. I started to be friendly with Singapore's self-proclaimed leading expertise to unexplained phenomenon who called themselves "sgfreakylinks".. perhaps people are right, due to their stupidity, everything is 'unexplained' to them.. I guess, the term 'stupid and arrogant Singaporean' is true. I financed few visit for my JB's friend, 2 or 3 visits, none of it succeeded. 1st ventured by Hairizal Saiyan, then by Abu Dobingo then the last visit by Pablo. Most of our communication failed while they are arriving in Tyersall compound. Came back empty handed. Service interrupted lah, no coverage lah.. things like that. Another friend of mine, En. Ezatt arranged a visit to a reaping old man, "Pak Raden" if I am not mistaken.. living in Kepong, who happened to be here and there, done this and that during his lifetime, one that you could considered knew everything on 'other' side of the world..
Now.. I present to you.. a Complete History of Tyersall Palace. Singapore just what we assumed. Stamford Raffle did respect the Agreement until his demised. 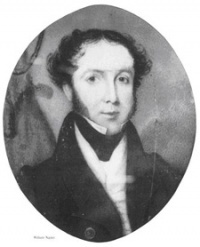 It was William Farquhar that annexed the whole Singapore island from Temenggung and Sultan Hussin via new Agreement signed in 1824. Temenggung and Sultan was forced to drop their ownership of the island, and relinquished all their right to their properties if they choose move from Singapore. Temenggung and Sultan objected. However, William Farquhar delay their monthly allowance for 3 months which in the end, forcing them to sign the new agreement. One of the condition is,"...If Temenggung and Sultan want to stay in Singapore, they had to be treated equal as other "citizen", make them a 'citizen' of Singapore. However, if Temenggung and Sultan wishes to move from Singapore, British would give 20k + 10k for both of them. Them, their descendents, and their heirs could not then acclaimed what they had left, inclusive plantations, properties, houses, palaces FOREVER"
Due to this unfortunate event in Malaya's history, entire Singapore was sold, in 1824. 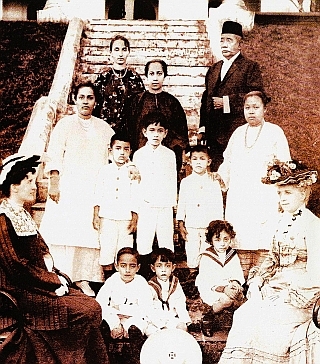 HH Temenggung Ibrahim started to move their family to reside in Johor Bahru. Meantime, they had not relinquish their ownership to Telok Blangah even the offer is attractive. They maintained their presence till now. Meantime, when HH Abu Bakar move their Government Office to Johor Bahru, HH Abu Bakar did maintained to station closest relative in Telok Blangah. 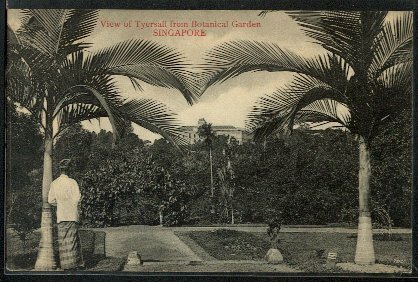 HH Abu Bakar bought Tyersall Estate in 1857. 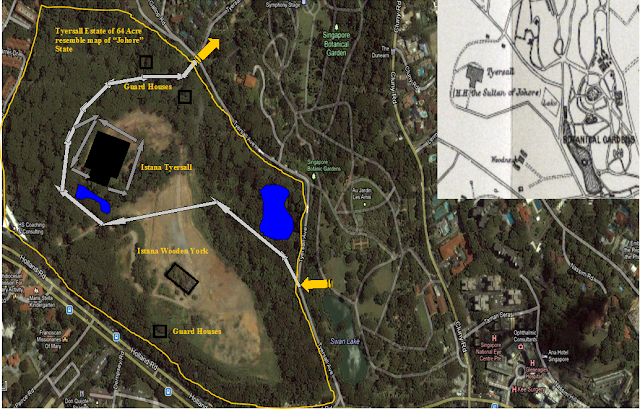 It is believed that Tyersall Estate is not comprising 64 Acres that time. "1 owner shall not have more than 34 Acres for personal property" as what Singapore's Land Code stated in 1830's. Balance 30 Acres of Tyersal Palace might belong to Captain B. Ross, a vigilante's that stormed the Sultan Brunei's Castle in 1870's. 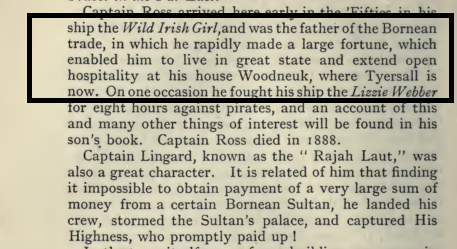 These old records shows that Woodneuk was built by Captain Ross. Singapore is booming. British need more land for reclaimation of new Port. The new Agreement in 1864 made HH Abu Bakar a sovereigned Ruler for the State of Johore.. and Telok Blangah... and any of his property in Singapore. 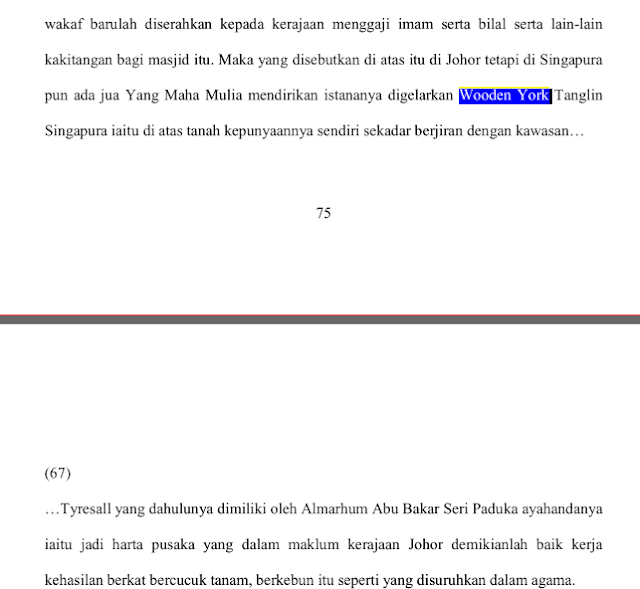 With the new Agreement, Tyresall Estate which he bought in 1857 become a “State Property of Johor” similar to Telok Blangah.. in other hand, Tyersall Estate andTelok Blangah 'is' the State of Johore. Tyersall House was a 'house' build by Willian Napier, resided at the same place where Istana Tyersall was later built. Most people assumed that, HH Abu Bakar demolised the "Tyersall House" and build a "Tyersall Palace".. but. I am afraid, that is not the case.. Original "Tyersall House" was totally destroyed by the fire in 1890. HH Abu Bakar then replaced it with gigantic Palace stand at the same area. The mystery of Tyersall Palace is began. There were plenty of chroniclers recorded the glittering parties conducted at Tyersall Palace. Should there be a British, American visitors, even the local less known such as Na Tien Piet. 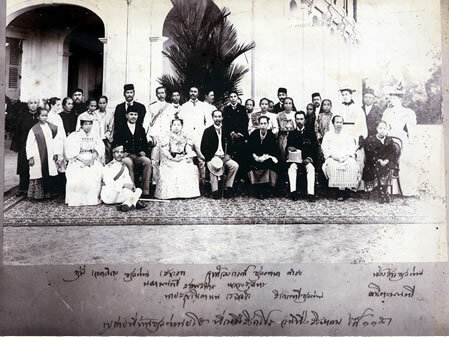 Foreign chroniclers usually wrote about the parties, while Na Tien Piet reported about the 'priceless treasures' stored in Tyersall Palace in his reknown Poetry called "Saer Baginda Sultan Abu Bakar"
It is the only personal resident that has been supplied with electricity in 1890 with its own 'air conditioning' system comprised blocks of ice underneath the artificial palms along the Ballroom even the British Resident General's house was not equipped of such facilities. Private parties in Tyersall has become a national sensation. Most people assumed that Tyersall Palace was totally destroy by fire in 1905 caused by electrical failure. At night of the fire around 2.00 am, burning start at Grand Ballroom, where all the expensive upholdstries and carpet was installed. A British officer nearby reported that engine generator and electrical supply was still running during the fire at 3.00 am. Should there be caused by electrical sparks, led to power trip, the generator should be stop and there will be no electricity at all. It could be a sabotage. I suspected it was perpetrated by a British themselves. 2. Tyersall heavy 'damages' was widely publicized by British newspapers. 3. HH Abu Bakar is a formidable man, when he's demised, HH Ibrahim become as powerful as his father. His influence far reached the Colonial Office in UK. By destroying this Palace, a venue where he demonstrating his power, his influence would be depleting. It was widely reported that the Palace was totally destroyed. That stupid Singaporean from Sgfreakylink is the best example of the product of these misleading reports by British neswspaper 100 years ago. Then, story of "Tyersall Palace" vanished in history. It would not be the case... Tyersall Palace is still standing for more than 30 years after the fire. WHAT WAS LEFT FROM 1905'S FIRE?? This was taken sometime in 1930's. Standing unscatched. This is not about "stairs to nowhere" of Elves's Palace in Istana Besar which I've presented elsewhere in the web.. but, it is basically about it's orientation which designed to confuse and obscure public. Most people assumed that, Grand Ballroom situated 'infron't of the Palace where the commanding tower stands, is where its caught in fire. “Entrance” of Tyersall Palace was situated AT THE BACK of the Palace. It has road leading to the right corner of the Palace and to Grand Portico IN FRONT of the Palace. "Exit" route was via the Portico to the right of the building to the back. One must go around the gigantic Palace in one circle for exit. 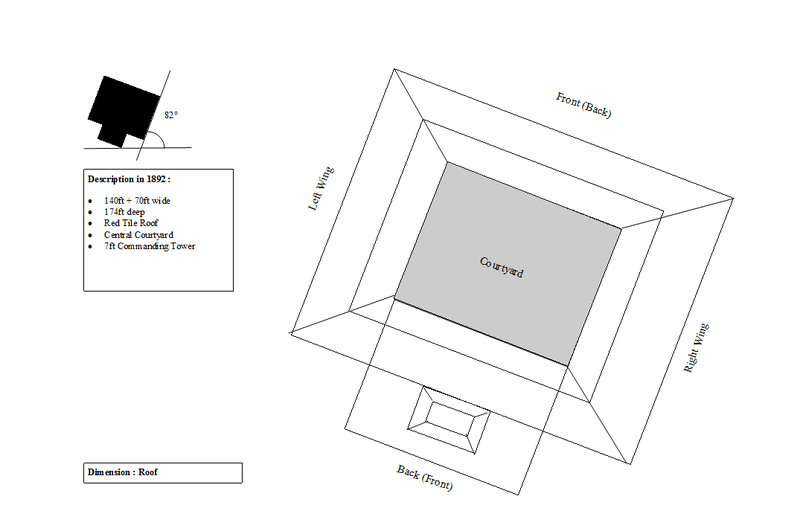 I have taken trouble to redesigned the palace. 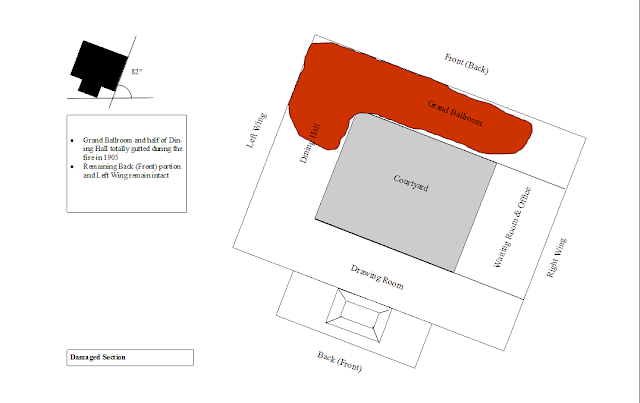 You might found the damaged area at the bottom of the sketch. Grand Staircase was located at the front Portico. Its lead you to the Drawing Room located at 1st Floor. Guess Room located at the Ground Floor on the left, while Card and Billard Room at the Right wing of the Building. HH Abu Bakar requently visited by his friend and hosting them at Tyersall Palace. Left Wing and Back portion at Ground Floor where his Private Quarter was, is absent from any record in 1892 as it was limited to the member of the household only. 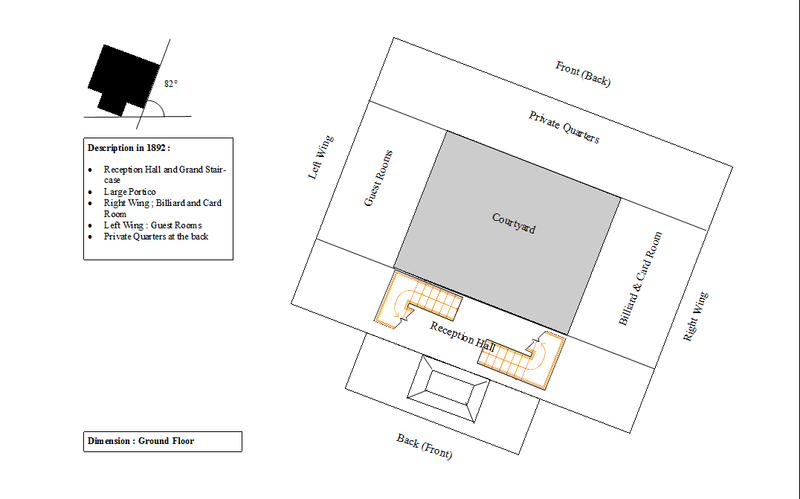 Located drawing room, halls of antiquities, a lounge and a Grand Ball Room via left wing. Right Wing was off-limit as it was the Office section of Johor Government. Impress the visitor, as they had to go around the Palace in complete circle before leaving. Again, Tyresall was made to impress. 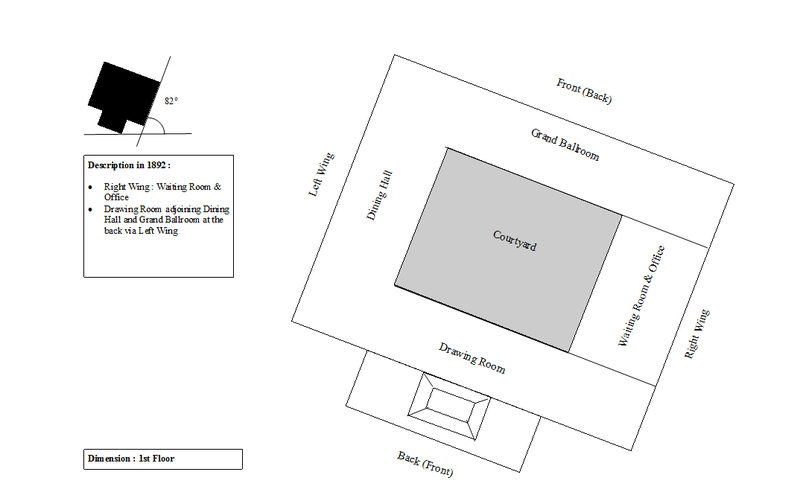 Visitors, mostly invited for a Ball would had to go thru the Drawing Room (which HH Abu Bakar display his collection of famous drawings) and right wing (where HH Abu Bakar store his treasures) to the Grand Ballroom situated at the 'back' of the Palace. That is the reason why most of the Chroniclers able to identify valuable items during their visit to Tyersall Palace, including Na Tien Piet which happend only visited this Palace 2 times during his life but he able to identify each item with its price tag!!! Most of the picture was showing 'front' portion of the Palace, there were no rear portion was ever taken. Wait... there are more in Tyersall that will make you confuse. In 2009, NST Journalist tried to get information from Dato’ Abd. Rahim Ramli about Tyersall Palace and Woodnuek. Instead of giving brief details, Dato' Rahim merapu telling the story of other places... thus leaving history tentang Istana Tyersall and Wdodneuk remains unanswered. 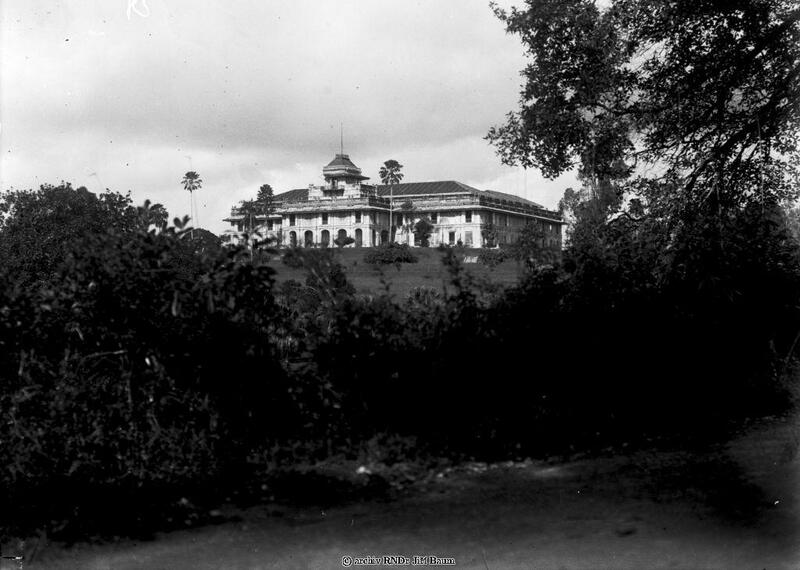 Istana Tyersall was entrusted with Resident Keeper apponted by HH Ibrahim to upket the palace and surronding including to take care of his Horses and Lembu. There were few quarters builds for worker. It would like the small kampung inside Tyersall Estate. In 1910’s, Colonial British want to rent the Tyersall Palace for Gymkhana. HH Ibraim let them use the facilities and fields for Polo, Race Car and Dog Hunt. HH Ibrahim leased his property and its surrounding with rental of $150/month for 7 years for 21 years. 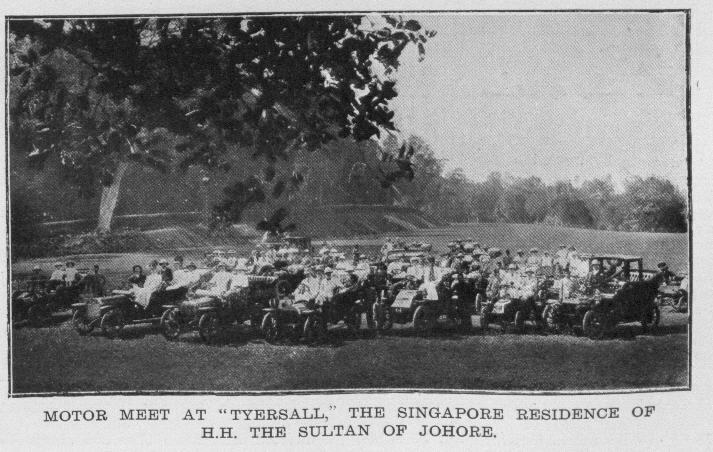 They were few picture in 1910's showing Tyersall Palace still standing. 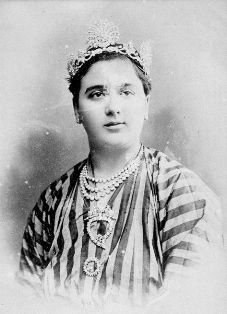 Later that year, they had trying to buy the Tyersall Palace, with budget costing to repair the damaged Ballroom of $75,000.00, However, it was not agreeable by Sultan. In 1934, Tyersall compund was used as Army Camp by British. JMF was also stationed here. Ex Johore's Prime Minister, Abd. Hamid was in service with JMF during the Mutiny, and escaped to Tyersall Palace during the attacked. Matters has been reported in "Untold History : 40 Penyamun and Sultan Ibrahim"
It was also reported that, in 1935, HH Ibrahim was issue a tender to demolish Tyresall Palace. However, even after 1935, especially in 1942.. there were few reports from Anzac Unit that they are using Tyersall Palace as their commanding centre. 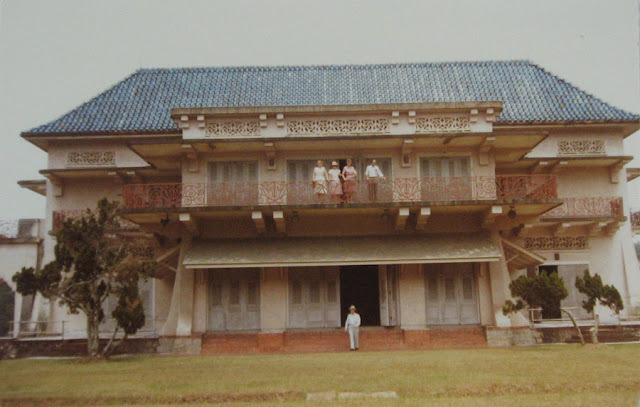 Story of Tyersall Palace vanished in history after the WWII. There were no other account ever mention about it along these period. 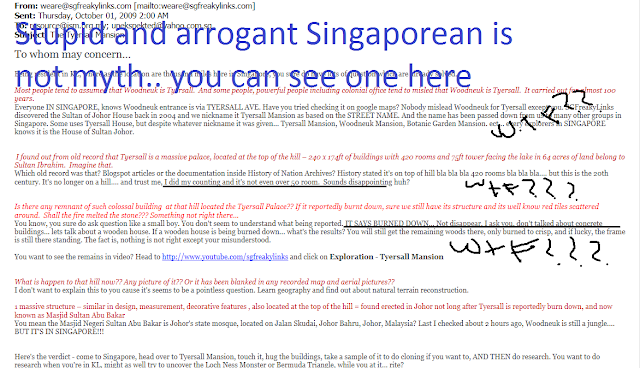 Until now. .
Fire in 1890 destroyed the "Tyersall House"
Continue at : "Unfortunate Case of Istana Wooden York"
My advise.. if Singapore Government really want to acquire Tyresall compound, believe me.. it was made for those who are dead.. and the dead keep it.